Miami art collective FriendsWithYou is doing their part to bring happiness to Gotham city. 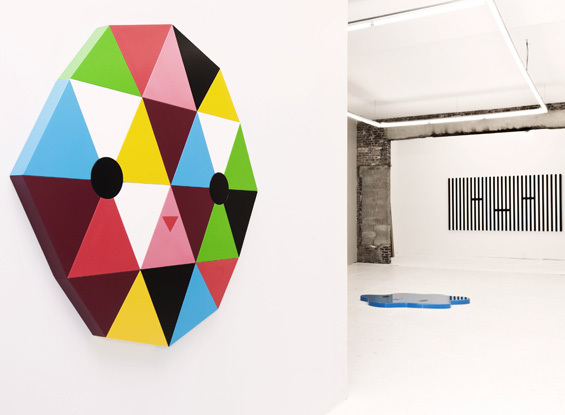 In their exhibition at The Hole titled, “:)”, and throughout their massive Rainbow City installation presented by AOL, color is abundant in their brand of cheerful and child-like Pop Art meets Minimalism. FriendsWithYou has brought its Rainbow City installation of 40 monolithic, stripey and colorful air-filled sculptures to town where it will reside until July 5. Coinciding with the opening of section 2 of The High Line, Rainbow City occupies a 16,000 sq ft lot on 30th St and 10th Ave where the High Line currently ends. The theme of “Magic, Luck, and Friendship” is continued throughout the inaugural exhibition of The Hole gallery’s new space at 312 Bowery. 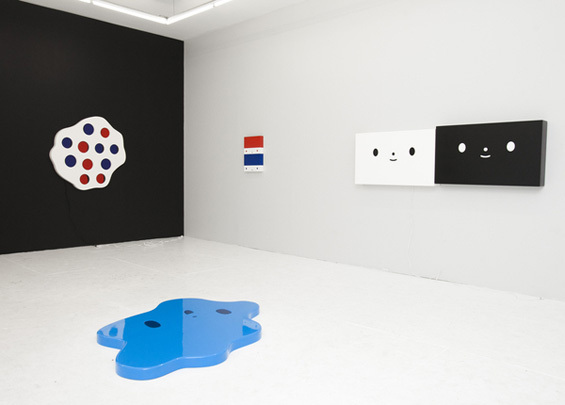 In FriendsWithYou’s first New York solo show works by Daniel Buren, Elsworth Kelly and Blinky Palermo are reimagined through the lens of a toddler. The relentlessly cheerful installation at The Hole includes 22 artworks, most of them made of lasercut MDF, car paint and acrylic. Some works have googly eyes that swivel back and forth and the smiley face is a prominent motif. 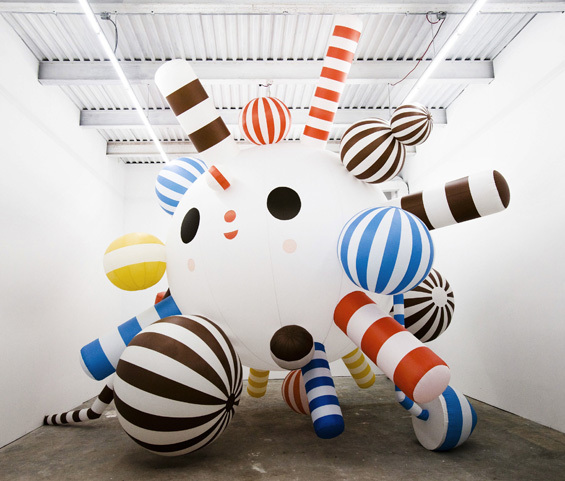 In this exhibition the gallery is turned into a playground and the viewer a child.